Masking stencils from Uschi van der Rosten helped Bruce paint the disc camouflage pattern on his Cyber-Hobby 1/35 scale SdKfz 166 Brummbär (late production) with Tamiya acrylics. He hand-brushed the soldiers’ Zeltbahn splinter camouflage with Vallejo acrylics. 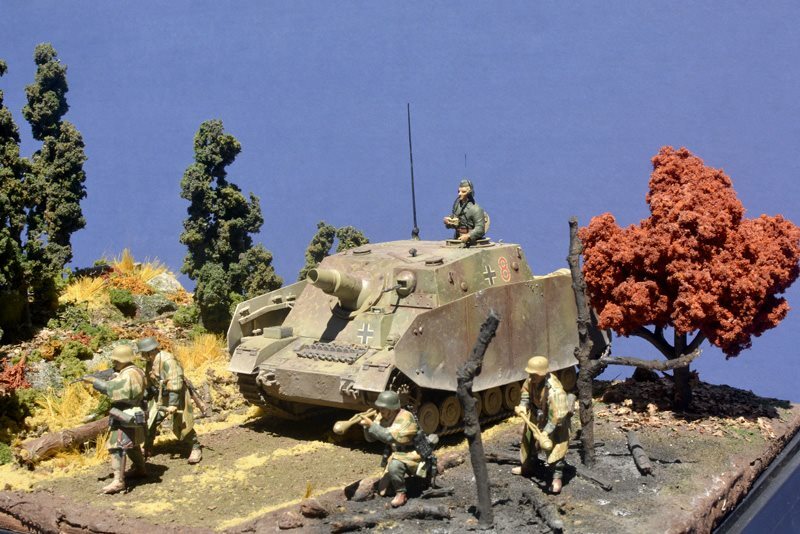 Based on groundwork made from papier-mâché and plaster, with Woodland Scenics foliage, Bruce's diorama portrays action in the Battle of Hürtgen Forest, near the Belgian-German frontier, September 1944-February 1945.